Most people will interact with art and design in some shape or form every day. Knowingly or not, art and design shape our lives much more than we might think. John Berger, in his influential book, Ways of Seeing, confirms our visual navigation of the world as a central component of today’s contemporary landscape, underlining the central role of art and design in our lives. What inspires creative practitioners is what inspires us all to do things to make our lives better. Artists and designers are great at doing something most of us can’t; creating an art or design practice that captures our emotional and intellectual lives and taps deep into our value and belief systems. We can appreciate works of art partly because they resonate with our inner beings; they allow us to make meaning of things, that we often lack the words, or any other means for that matter, to express. Interestingly, natural disasters, acts of terror and/or other major disruptions in our lives are often areas that artists look to as both a source and a focus of their creative efforts. It is through this link between art /design and major disruptions, as well as a broader spectrum of creative output, that we can examine some of the many artistic sensibilities common to creators of things we all gravitate towards at some time or another. Metzl (2008) writes that there are several characteristics associated with creativity that seem likely contributors to processes of resilience, including but not limited to personal flexibility (Meneely & Portillo, 2005), divergent / elastic thinking (Torrance, 1995), high conscientiousness and social expressiveness (Csikszentmihalyi, 1996; Getzels & Jackson, 1963) and awareness of self, expressiveness (Barron, 1969). Natural disasters impact on people because they disrupt many, if not all, our needs roughly along the lines of Maslow’s hierarchy of needs. Regardless of how current this well understood model of human needs is today, its relevance remains strong given that most people can understand how we humans function. In most cases we are guided by needs that start with food and shelter and slowly graduate to our higher intellectual and emotional needs, such as self-actualisation. Restoring these needs after a major flood or an earthquake means we look to different things for help. An essential part of such a process is our ability to reflect on the events after they pass and to try and create a narrative that fits in with our belief system; and one that reinforces our values and our way of functioning as psychological beings. The past 10-15 years have seen a significant increase in the frequency of natural disasters globally. More significantly, the effects of many of those disasters have had larger global impacts because of increasing interdependencies. Decades ago any form of art chronicling these events would have been only locally relevant; now they are afforded global relevance and are of interest to a much larger audience. Given that many disasters are global in impact, a work of art that deals with local disasters can become globally appreciated. Somewhat ironically, natural disasters then create a space for connectedness and concern for one another globally more effectively than what otherwise would be the case. Take for instance the TV series Treme, which lasted for four seasons starting in 2010, five years after Hurricane Katrina. The series explores a diverse set of issues which affected the New Orleans community after the infamous disaster. As a drama it explored many things that have not been well understood or explored in media coverage following the disaster. The limitations by which traditional and emerging media operates translated into a perhaps limited understanding of how the residents of New Orleans and surrounding areas were affected. Treme, as a drama, was critically acclaimed and conveyed a story that many felt was true and vital. Similar examples of sinetrons (soap operas) in the Asia Pacific region weave issues of resilience throughout their narratives and have the ability to reach of millions with their message and inspire a sense of community. Indonesia, the supermarket of disasters, is one such example with an increase in recent years of dramas exploring issues of adaption in the wake of the many disasters across the archipelago. But one did not have to follow a TV series to learn the story of Katrina. There were other forms of expression. Graphic novels have also become a vital means of creative expression resonating with diverse audiences. 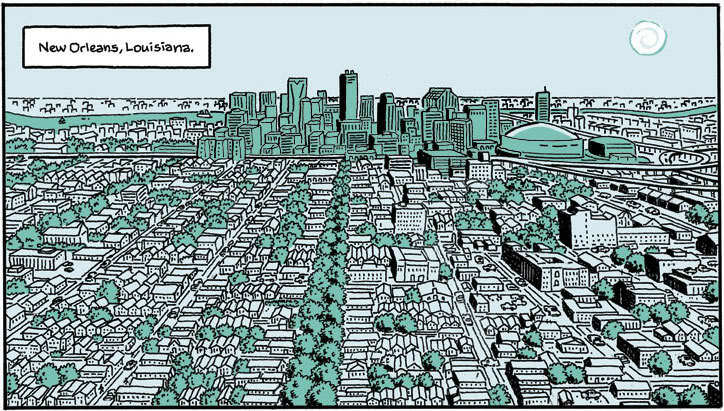 The importance of Josh Neufeld’s A.D New Orleans After The Deluge lies largely in the very experience of the author who volunteered for The American Red Cross during the response and recovery period. Neufeld initially blogged about his experience, which later led to serialisation of an online graphic novel by SMITH magazine, and subsequently to the release of a printed version that was praised for its raw emotion and depiction of truth. It is worth noting that graphic novels and comics often draw many artists to write/draw stories about natural disasters or other major catastrophes such as the 9/11 terrorist attack. Many of these stories reveal information, events and situations that rarely attract mainstream media without diminishing the power to move us. Art has been used to tell stories about natural disasters forever really. Look at Aboriginal and Torres Strait Islander cave paintings for instance. It’s not a new thing. What may be new is the meaning that art presents, perhaps to new audiences. It captures different interpretations of events from say those that took place centuries ago. Artistic sensibilities and trends are different today. Disasters also impact us differently. All these things come into play when we consider forms of art we feel close to and how they can best tell the story of an event or experience of disruption. It is not always simple to define where art starts or stops and where other disciplines take hold. The case in point is this year’s Venice Biennale which featured installations by Kashef Chowdhury and URBANA that combine architecture and art focusing on events such as floods. This unique manner of presenting built spaces allows for a more interactive way for people to get closer to the idea of what some communities (in this case in South East Asia) face with regular flooding events. Likewise the work of Fiona Hall responded to core concerns around the persistent role of human development in nature’s demise. Hall’s work highlights the interdependency of disruption today to the intersecting concerns of global politics, world finances and the environment. Adding artistic elements to contributions for the Biennale may also help people see more than what evening news programs (and increasingly less often) are able to present. Art may help us to see natural disasters in a fresh way, which is important as we are becoming increasingly immune to these events over time. Disasters have inspired many people to seek creative ways to express their inner sensibilities. One interesting example is the work of Dakota Sandras who recycles materials found in the debris after natural disasters and turns them into works of art. Another is “Baptism of concrete estuary”, inspired by the earthquake and tsunami in Japan, by painter and multimedia artist Jave Yoshimoto. The figurative ‘scroll project’ (42 inch-by-30-foot) as explained by Yoshimoto is a homage to victims of the 2011 disaster and deals with the surge of images that flooded the internet and began to haunt him in the wake of the disaster. The list of similar art projects is seemingly endless. A combination of the increased rate of natural disasters over the past three decades and the ease with which these stories can be shared globally has created an almost permanent source of artistic inspiration, which conversely is starting to appeal to global audiences that seek to better understand disasters and, more importantly, shelter their lives from what can be an overwhelming experience. Jelenko is the founder/editor of ResilienceReporter.com, a seven day a week resilience news, analysis and resource portal focusing on making resilience a recognisable topic for the general population. ← Are Australians prepared for one of the world’s largest earthquakes?